It's clear that two of the biggest beverage companies in the world are moving in opposite directions. Starbucks (NASDAQ:SBUX) and Coca-Cola (NYSE:KO) are two of the biggest beverage companies in the world, but that may be where the similarities between them end. Though both companies traffic in caffeine, Starbucks has risen to prominence with a network of more than 25,000 cafes around the globe, while Coca-Cola is known for its bottled beverages, available worldwide through a distribution network that's arguably unmatched by any other consumer goods company. 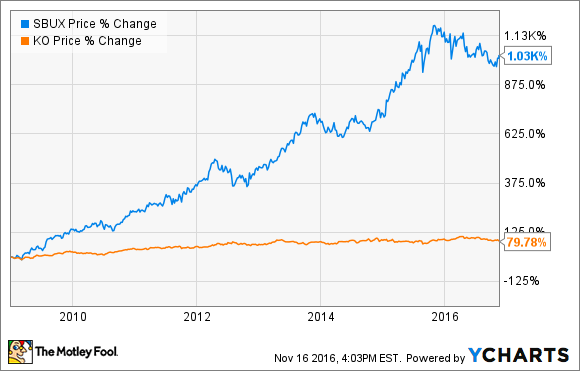 Both stocks have been big winners over their histories, but Starbucks has been the clear victor since the recession. Still, past performance is not necessarily an indicator of future results. With that in mind, let's take a look at what each stock has to offer today. With its combination of growth potential and solid dividend payouts, Starbucks is a rarity among stocks, especially in the consumer goods sector. The coffee giant just posted operating income growth of 16% in the fiscal year it just completed, and sees earnings per share growing 15% for the current year. It also just raised its quarterly dividend 25% to $0.25/share, offering a 1.8% dividend yield, nearly as much as the S&P 500's at 2.1% -- but Starbucks offers much more growth than the broad-based index. Since paying its first dividend in 2010, management has raised the payout by 23% or more each year. And though it may seem like the company's cafes are already ubiquitous, Starbucks has several pipelines that promise to deliver steady revenue growth over the coming years. It plans to open 500 stores a year in China over the next five years with the goal of reaching 5,000 by 2021, and expects that country to one day have more cafes than the U.S. Shanghai, for comparison, already has more Starbucks locations than any other city in the world. Shanghai will also be the home of the company's second Reserve Roastery when it opens next year. Meanwhile, Starbucks' mobile payments program has been an overwhelmingly success. 21% of transactions at U.S. stores are now made through the mobile app, and 6% are performed using Mobile Order & Pay, a service that allows Starbucks customers to seamlessly come in and pick up their beverages without having to even stop and pay, adding a benefit that competitors like independent coffee shops cannot match. Next year will also bring the first of Starbucks' new Reserve cafes, a part of what CEO Howard Schultz calls the premiumization of the brand. Borrowing from the innovative roasts and beverages at the Reserve Roastery, the Reserve cafes will offer a unique beverage and food menu in a more upscale setting. Starbucks expects to open more than 1,000 of such cafes, which should allow the company to continue to penetrate mature markets such as American cities. While coffee continues to gain in popularity, soda has been increasingly falling out of favor among Americans. Voters made that clear earlier this month when four cities approved soda taxes, including San Francisco, Oakland, and Albany in California, along with Boulder, Colo. Earlier this year Philadelphia also passed a soda tax, and several countries in Europe and Mexico have done the same. The backlash against sugary beverages is nothing new. Soda consumption has been falling for more than a decade in the U.S, and diet soda sales have been dropping even faster on concerns about artificial sweeteners like aspartame. Coca-Cola and rival PepsiCo (NASDAQ:PEP) have been adjusting their portfolios accordingly. Coca-Cola once generated just 10% of its sales from still beverages, but that category now makes up 30%. In recent years, it's made investments in energy drink-maker Monster Beverage and Keurig Green Mountain, which ended when that company was bought out by JAB Holding Company. It's also introduced brands such as Gold Peak and Fuze in the iced tea category, and even partnered with Dunkin' Donuts to make a bottled coffee drink to compete with the Starbucks-Pepsi joint venture that produces the bottled Frappucino and Doubleshot. Those efforts to diversify have helped Coke deliver modest revenue growth, as the company sees organic revenue increasing 3% this year, and its earnings per share has grown thanks to aggressive share buybacks and cost-cutting. Still, the long-term picture looks challenging as long as sugary beverages continue falling out of favor. Of the two companies, Starbucks has the much stronger growth opportunities. Coffee consumption is increasing while soda consumption is falling. Starbucks, thanks to a number of growth initiatives, seems well on its way to reaching $30 billion in revenue by 2019, a goal it laid out in 2014 when it had just $16 billion in sales. Coca-Cola has plenty of assets, including some of the world's most valuable brands and a global marketing and distribution reach, but they haven't been enough to overcome the secular headwinds in its industry. In addition, Coke stock is nearly as expensive as Starbucks', at a P/E of 25 versus 29 for the coffee chain. Considering Starbucks' much greater growth potential, the java giant look like a bargain at those valuations. Starbucks is clearly the better buy here.